You are here: Home / Seller's Corner / Why Sell My Mortgage Note? Owner financing seemed like a good idea at the time. Let the buyer make payments and get the property sold. After all the seller carry back is known for attracting purchasers and providing quick closings, without the hassles or fees of a conventional bank loan. But circumstances change and many sellers would prefer a lump sum of cash today rather than monthly payments that trickle in over the next 10, 20, or 30 years. Reduce debt or pay expenses including medical bills, college tuition, credit card balances, and home repairs. Pay down a home loan or payoff an existing mortgage on the property sold. Start a new business, fund an IRA or retirement account, buy another piece of real estate, or make a profitable investment. Distribute partial ownerships or settle disputes for notes involved with an estate, probate, dissolution of marriage, bankruptcy, partnership, or other entity. Take a dream vacation, fulfill a passion, enjoy retirement or buy a new car, boat or RV. You don’t have to sell the entire cash flow. Depending on the goals, selling just a portion of the payments might be a preferred choice. Investors are willing to purchase a certain amount of each payment (say $500 per month out of a $1,000 payment) or just some of the payments (say the next 5 years out of the remaining 30). Known as a partial purchase, this provides access to some of the cash now with interest and payments still accumulating for future use. It also helps minimize the discount since the payments due sooner are worth more to an investor. Selling a note is not the right answer for everyone. There’s a potential loss of interest income and tax benefits. Some high-risk notes just won’t be marketable for a price that makes sense. However, it pays to know your options. Most investors are willing to provide a no cost no obligation quote for review with a CPA or attorney to help find the best solution for your personal situation. Wondering how to reduce the discount and sell your mortgage or trust deed for top dollar pricing? 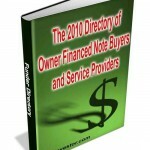 Be sure to grab your copy of 21 Insider Secrets You Must Know Before Selling an Owner Financed Note, provided as a free bonus with any purchase of the Note Buyers Directory.